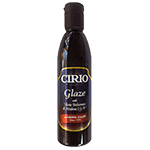 Authentic Italian CIRIO Glaze. Made with balsamic vinegar of moderna IGP and perfect for garnishing, decorating, and enhancing creative culinary delights. Product of Italy.